Manindra Gupta is a prominent poet on this era. According to many, he was one of the most influential poet in Bengal after independence. West Bengal Bangla Academy gave him the highest honor of Bengali literature "Rabindra Award" for his book 'Tung Tang Shabda Nishabda'. He also wrote many notable books- 'Chander Opit', 'Askhay Malbery', 'Adhara' etc. Poetry books- 'Laghuchhanda', 'Bonojotsyna' etc. 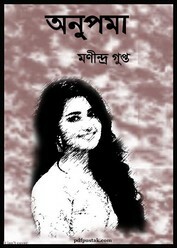 Now I want to share another popular book of this great poet- 'Anupoma'.